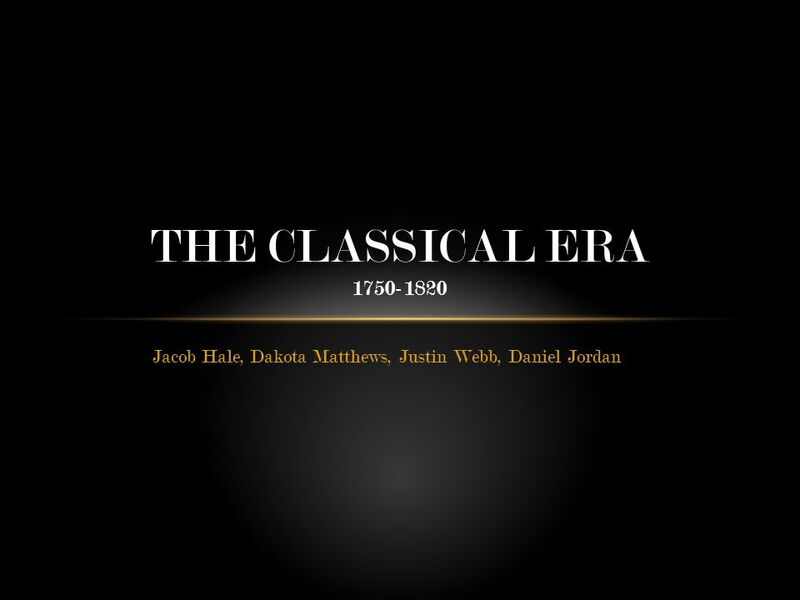 Jacob Hale, Dakota Matthews, Justin Webb, Daniel Jordan THE CLASSICAL ERA 1750-1820. 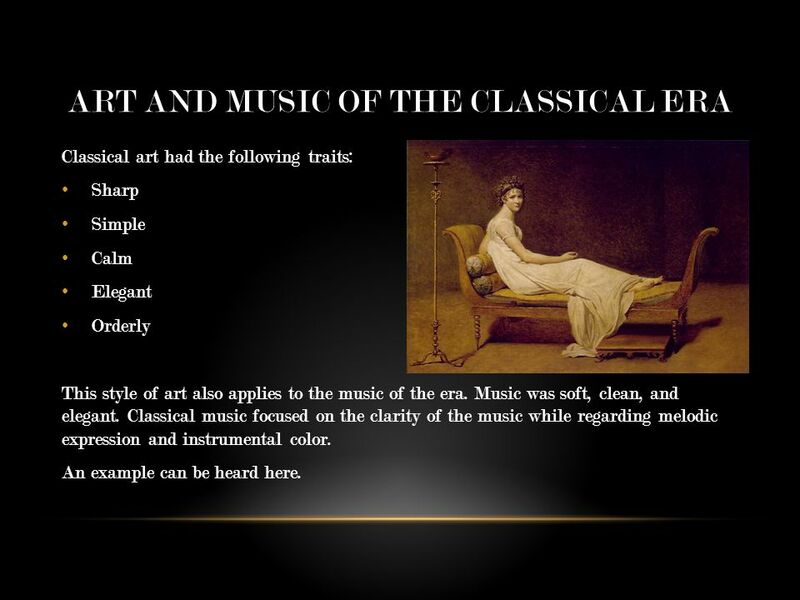 3 ART AND MUSIC OF THE CLASSICAL ERA Classical art had the following traits: Sharp Simple Calm Elegant Orderly This style of art also applies to the music of the era. Music was soft, clean, and elegant. Classical music focused on the clarity of the music while regarding melodic expression and instrumental color. An example can be heard here. 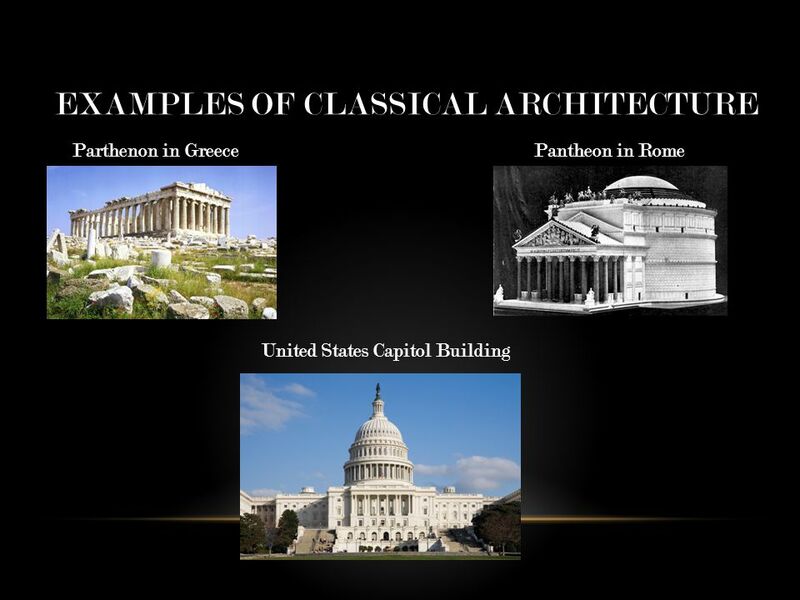 4 ARCHITECTURE OF THE CLASSICAL ERA Buildings in the classical era were made of wood, stone, or marble. Most buildings had very exquisite designs carved into them. 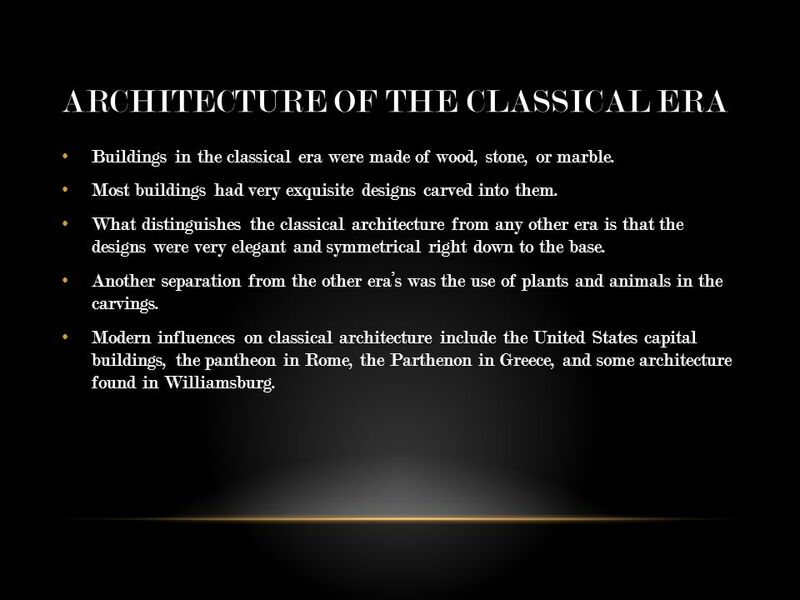 What distinguishes the classical architecture from any other era is that the designs were very elegant and symmetrical right down to the base. Another separation from the other era’s was the use of plants and animals in the carvings. Modern influences on classical architecture include the United States capital buildings, the pantheon in Rome, the Parthenon in Greece, and some architecture found in Williamsburg. 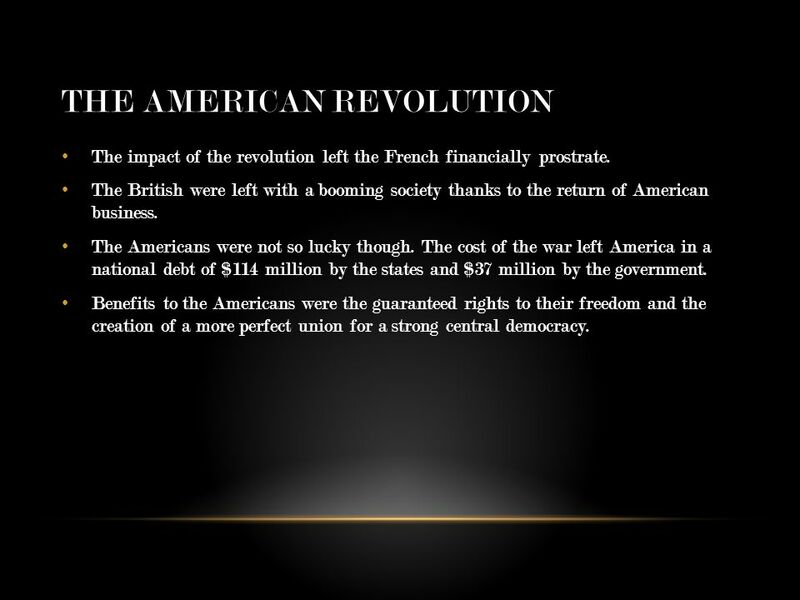 9 THE AMERICAN REVOLUTION The impact of the revolution left the French financially prostrate. The British were left with a booming society thanks to the return of American business. The Americans were not so lucky though. 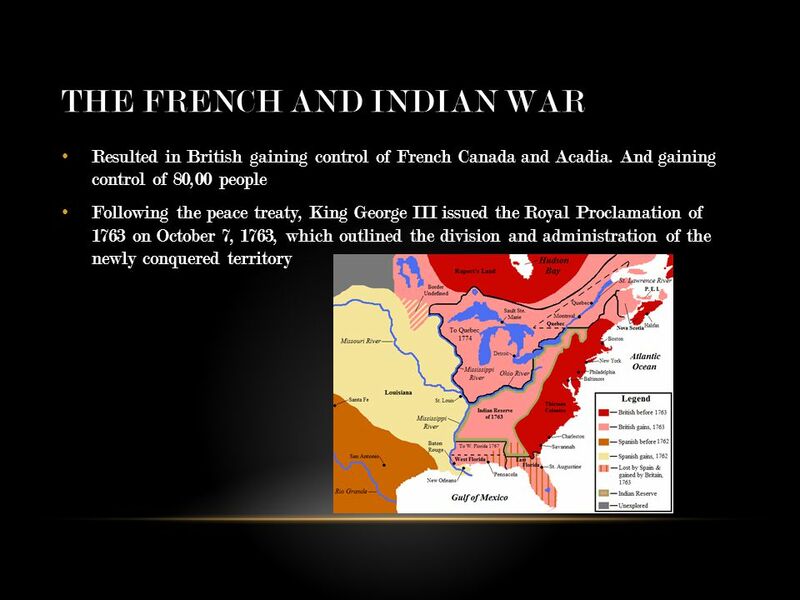 The cost of the war left America in a national debt of $114 million by the states and $37 million by the government. Benefits to the Americans were the guaranteed rights to their freedom and the creation of a more perfect union for a strong central democracy. 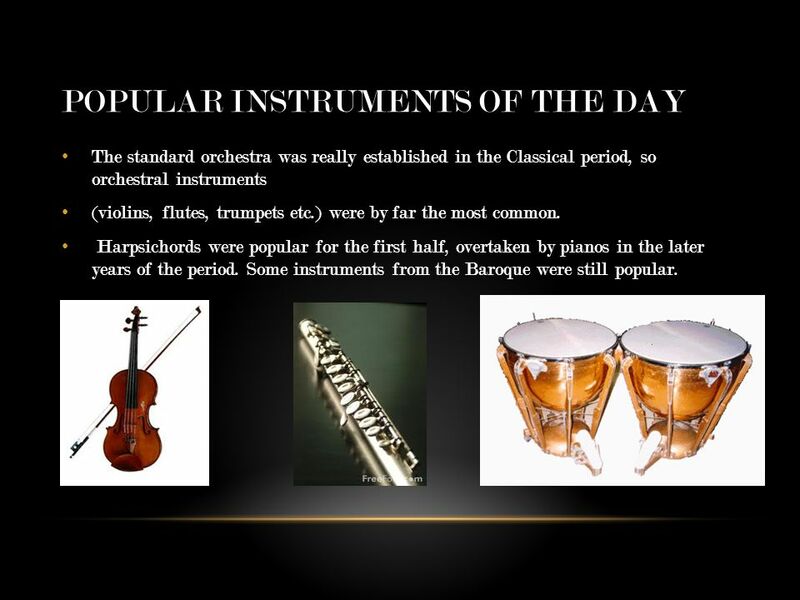 10 POPULAR INSTRUMENTS OF THE DAY The standard orchestra was really established in the Classical period, so orchestral instruments (violins, flutes, trumpets etc.) were by far the most common. Harpsichords were popular for the first half, overtaken by pianos in the later years of the period. Some instruments from the Baroque were still popular. 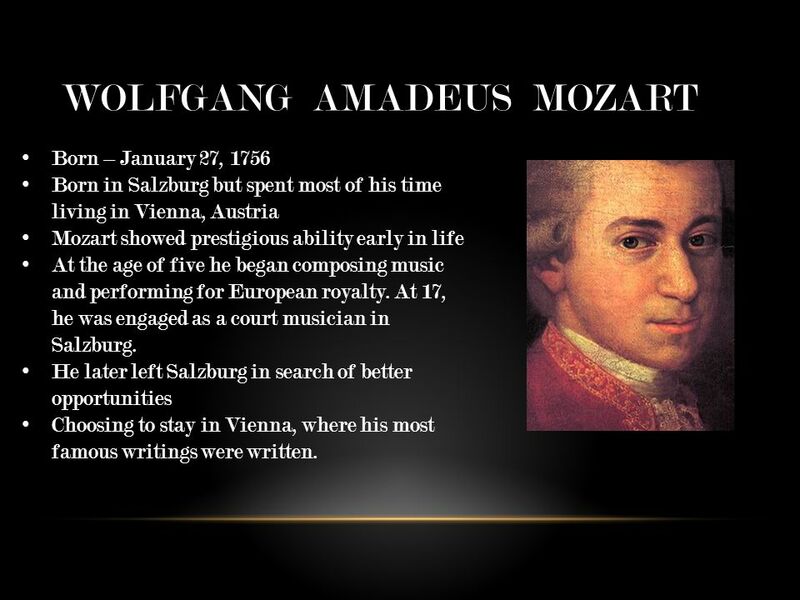 11 WOLFGANG AMADEUS MOZART Born – January 27, 1756 Born in Salzburg but spent most of his time living in Vienna, Austria Mozart showed prestigious ability early in life At the age of five he began composing music and performing for European royalty. 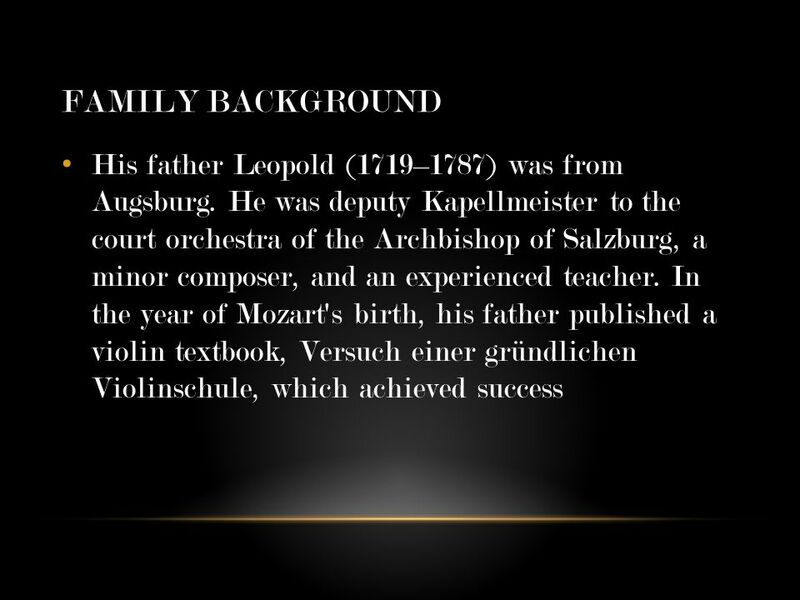 At 17, he was engaged as a court musician in Salzburg. He later left Salzburg in search of better opportunities Choosing to stay in Vienna, where his most famous writings were written. 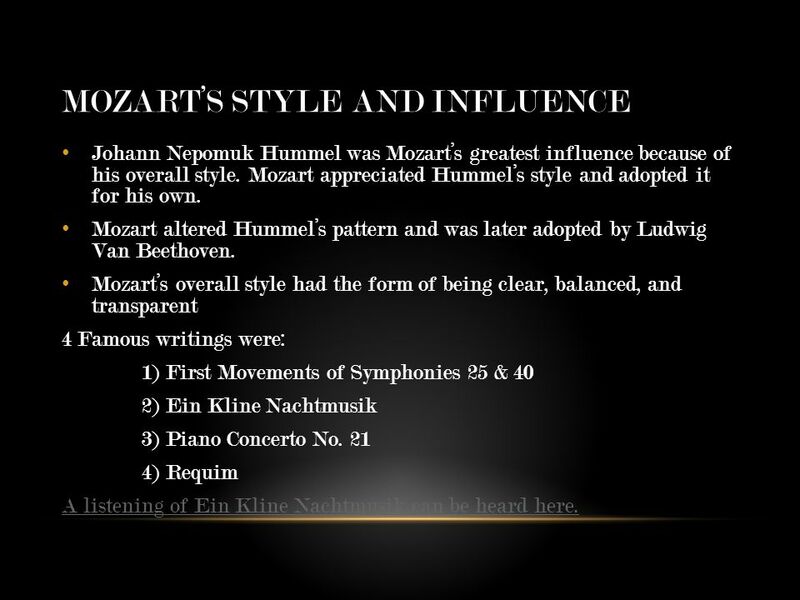 12 MOZART’S STYLE AND INFLUENCE Johann Nepomuk Hummel was Mozart’s greatest influence because of his overall style. Mozart appreciated Hummel’s style and adopted it for his own. Mozart altered Hummel’s pattern and was later adopted by Ludwig Van Beethoven. Mozart’s overall style had the form of being clear, balanced, and transparent 4 Famous writings were: 1) First Movements of Symphonies 25 & 40 2) Ein Kline Nachtmusik 3) Piano Concerto No. 21 4) Requim A listening of Ein Kline Nachtmusik can be heard here. 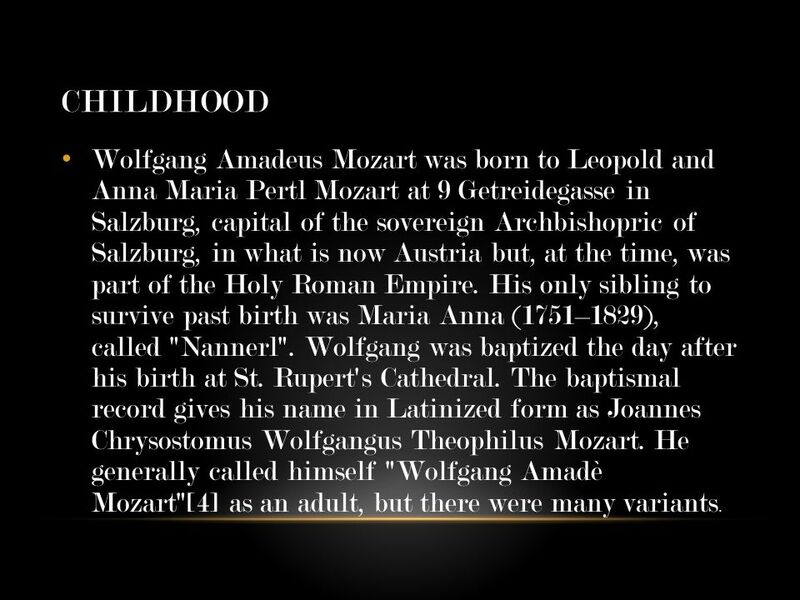 14 CHILDHOOD Wolfgang Amadeus Mozart was born to Leopold and Anna Maria Pertl Mozart at 9 Getreidegasse in Salzburg, capital of the sovereign Archbishopric of Salzburg, in what is now Austria but, at the time, was part of the Holy Roman Empire. His only sibling to survive past birth was Maria Anna (1751–1829), called "Nannerl". Wolfgang was baptized the day after his birth at St. Rupert's Cathedral. The baptismal record gives his name in Latinized form as Joannes Chrysostomus Wolfgangus Theophilus Mozart. He generally called himself "Wolfgang Amadè Mozart" as an adult, but there were many variants. 16 A LITTLE BIT ABOUT HIM He is often called the "Father of the symphony" and "Father of the string quartet" because of his important contributions to these forms. 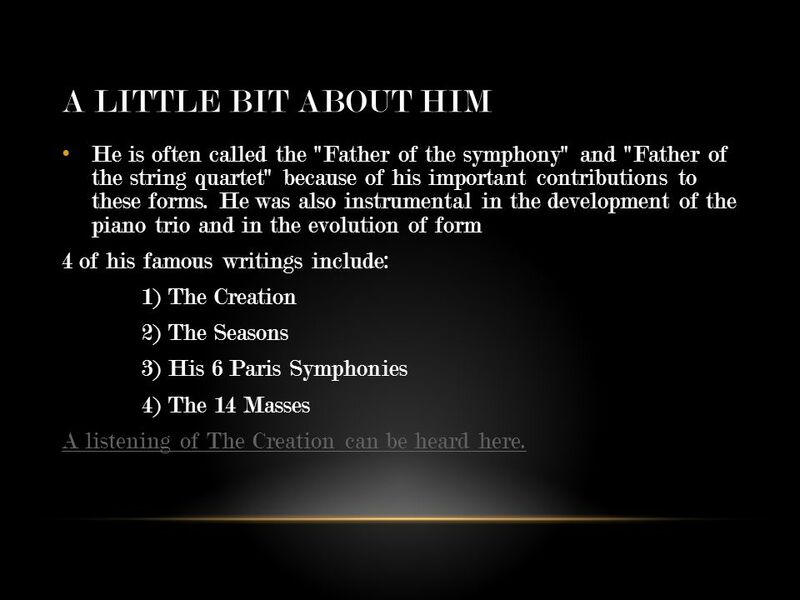 He was also instrumental in the development of the piano trio and in the evolution of form 4 of his famous writings include: 1) The Creation 2) The Seasons 3) His 6 Paris Symphonies 4) The 14 Masses A listening of The Creation can be heard here. 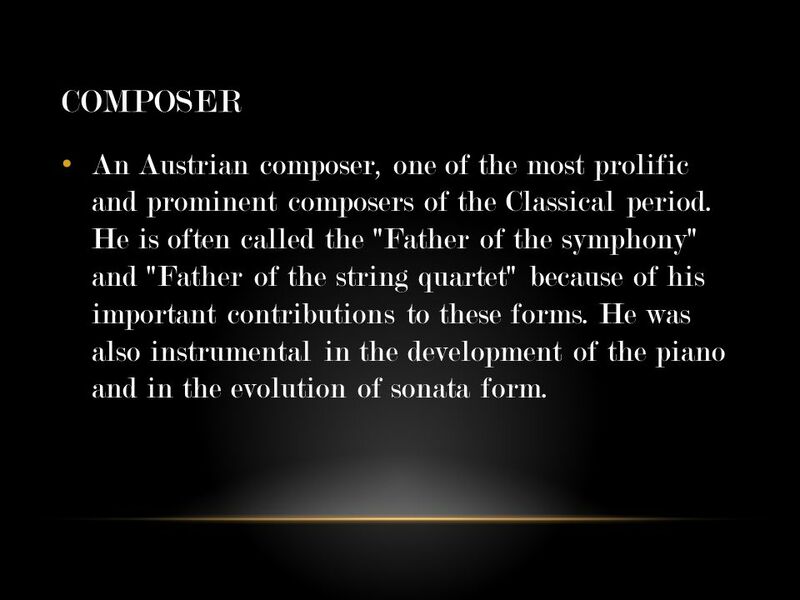 17 COMPOSER An Austrian composer, one of the most prolific and prominent composers of the Classical period. He is often called the "Father of the symphony" and "Father of the string quartet" because of his important contributions to these forms. 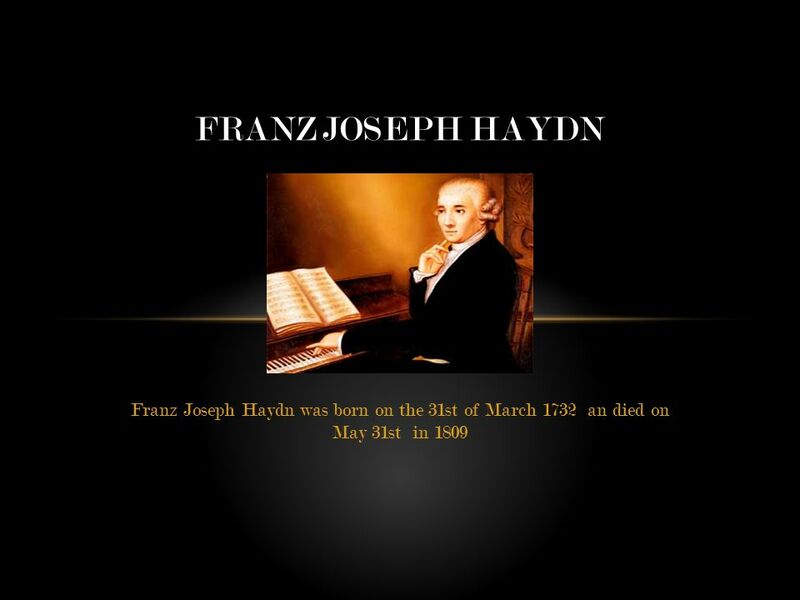 He was also instrumental in the development of the piano and in the evolution of sonata form. 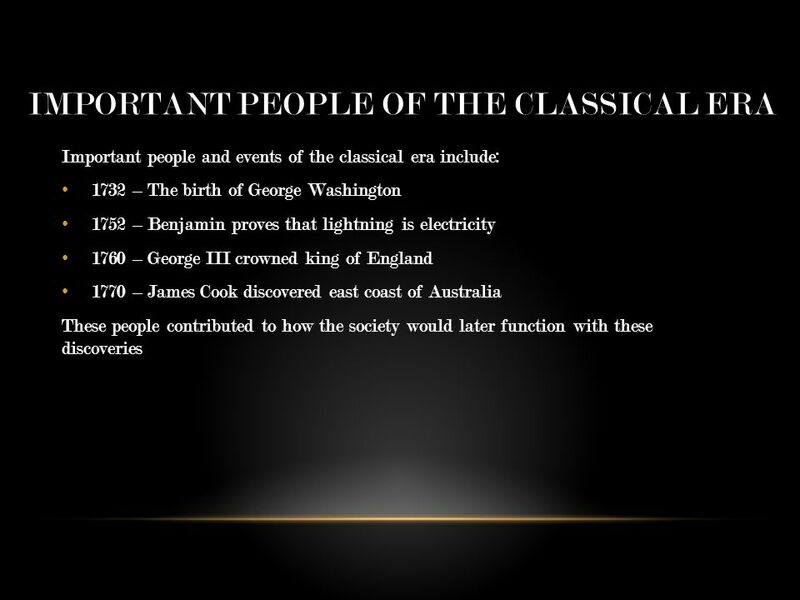 Download ppt "Jacob Hale, Dakota Matthews, Justin Webb, Daniel Jordan THE CLASSICAL ERA 1750-1820." 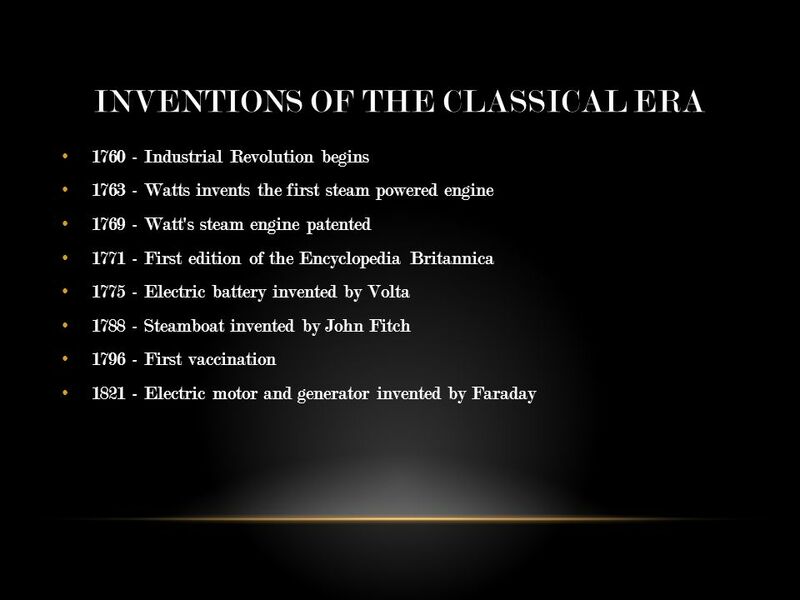 Classical Music The Classical era lasted from 1750 – 1820, beginning when J.S. Bach died in 1750 Classical music emphasizes phrasing and dynamics. There. The Classical Period (c ) Composers of the Viennese School Composers of the Viennese School Wolfgang Amadeus Mozart ( ) Wolfgang Amadeus. Wolfgang Amadeus Mozart Considered by many to be the greatest composer to ever live. Copyright © Frankel Consulting Services, Inc. The Classical Era Copyright © Frankel Consulting Services, Inc.
Wolfgang Amadeus Mozart By Quinn Pitcher. Mozart’s Early Years Wolfgang Amadeus Mozart was born in Salzburg, Austria (1756) Known as a child prodigy in. 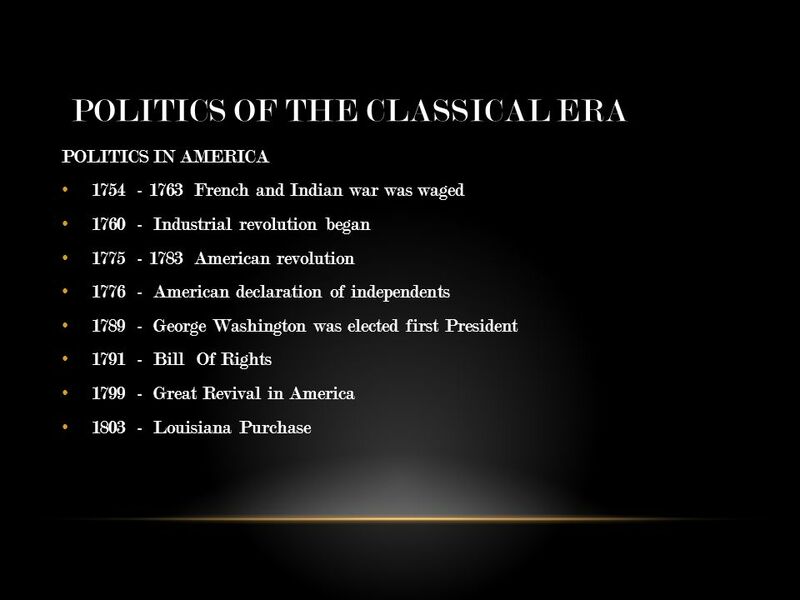 Music History Classical Period 1750 – 1825 AD. What was life like during the Classical period? Music, Art, and Architecture Music Light, clean texture, less complex than Baroque Contrasts are more pronounced Mainly homophonic (melody. 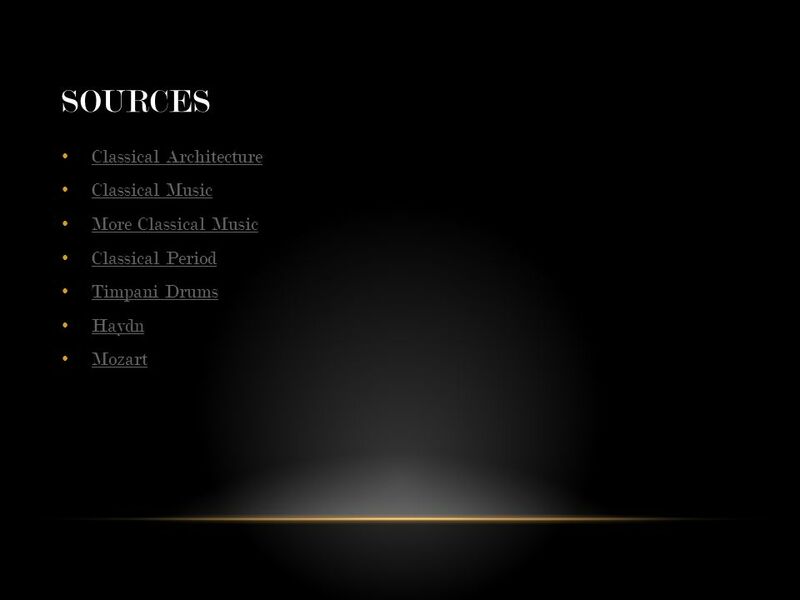 Classical Music Europe: 1750 CE-1830 CE. Wolfgang Amadeus Mozart. Wolfgang Amadeus Mozart (pg 56) Born in Salzburg, Austria on January 27, 1756 Born in Salzburg, Austria on January 27, 1756 Died.  Born: Austria, March 31, 1732 Died: Vienna May 31, 1809. He is considered to be one of the greatest geniuses in his field. By: Jackson Lund.  Born January 27, 1756 in Salzburg Austria  Classical Songwriter and composer  Mother Anne Maria Pertl  Father Johann George Leopold. Mozart By Mia Venturini. Genre Classical music including symphony (string, woodwind, brass), opera, solo concerto ( 1 person), chamber music including.